Stone isn't interested in merely bashing modern football: Any Given Sunday looks at the best and worst of the sport. 162 min. Warner Bros. Pictures International, FX Network. Directors: Oliver Stone, Allan Graf. Cast: Al Pacino, Cameron Diaz, Dennis Quaid, James Woods, Jamie Foxx. An artist in a business increasingly given over to philistines, Oliver Stone has a history of making widely distributed "art films," pictures that send one out into the street thinking, "How did he get away with that?" Stone's impressively mounted football fantasia Any Given Sunday is just such a picture, but it also came at a turning point of sorts for the director. It would be another five years before Stone released another narrative film, and then one primarily backed by foreign investors (the financial flop Alexander). Next stop: the decidedly mainstream World Trade Center. It's certainly conceivable that in 1999, Stone was feeling the heat and finding his artistic battles harder to fight in Hollywood, which makes Tony D'Amato a quintessential Stone surrogate. Miami Sharks coach D'Amato (Al Pacino) is a proud member of football's old guard, but his team is at a crossroads. When aging quarterback Jack "Cap" Rooney (Dennis Quaid) is sidelined by a brutal hit (and the backup quarterback also gets knocked down), D'Amato must call third-string quarterback Willie Beamen (Jamie Foxx) into action. After vomiting out his nerves and with the sage advice of D'Amato, Beamen finds his focus and soon becomes anointed a new star, complete with rap song. With Beamen branded "the future," staunch Rooney loyalist D'Amato increasingly appears to be the franchise's past. The team's aggressive young president-owner, Christina Pagniacci (Cameron Diaz), has no patience: she eagerly colludes with offensive coordinator Nick Crozier (Eckhart), himself an impatient heir apparent. Stone deals with the contradictions and tragedies inherent in the sport as its practiced today. Multi-million-dollar player salaries hardly seem out of place given the physical punishment and attendant short careers they face. The threat of injuries regularly raises ethical questions. Team doctor Harvey Mandrake (James Woods) has learned to rationalize his breaches of medical ethics, though underling Dr. Ollie Powers (Matthew Modine) isn't so sure of himself. When one player (former New York Giant Lawrence Taylor) demands self-destructive clearance to play on and earn a million-dollar bonus, D'Amato faces a moral decision: there's what's right for the team, what the player thinks is right for himself, and the looming probability that the player could die for the team and his payday. The team's motto? "Sharks Football: Whatever It Takes!" "Life's this game of inches. So is football," says D'Amato. The team's mileage is emphasized, especially by the pundits in the press box (Stone plays one; Stone regular John C. McGinley plays another. The increasingly intrusive media call D'Amato "Coach Stone Age"; in a classic bit of Stone subjectivity, the play-by-play man identifies Rooney as 38 and, minutes later, after his injury, as 39. Even fresh star Beamen is feeling a suspicious strain in his arm, suggesing his career may peak far sooner than anyone expects. The pressure goes nearly to the top: even Pagniacci has to answer to the ghost of her father and the very real presence of the football commissioner (Charlton Heston, who has a grand time with the line "I honestly believe that woman would eat her young"). But no one feels the heat more—on the field and off—than the fragile-bodied players who know nothing else. Salvatore Totino's ground-level camera can be downright terrifying; football scenes before and since have yet to trump these amazing P.O.V. sequences. When Stone uses DMX's "My Niggas" in a bone-crunching montage, it could be not only an expression of communal toughness but a musical pun for how the owners view the players—black or white—as disposable. The players' gold-digging-harpy wives are little consolation, leading to "extra-curricular activities" (even D'Amato, dreaming of something more substantial, succumbs to the wiles of Elizabeth Berkley's high-class prostitute). While there's a certain modern realism to the particulars of corporate and team politics, Stone gleefully plays up the symbolism of the players as gladiators clashing for the delight of upper and lower classes alike. The script by Stone and John Logan (Gladiator) make reference to the team's Pantheon Cup win and "praying to the football gods," D'Amato watches Ben Hur in his home when Beamen comes for a sitdown, and the ghosts of warriors past keep flashing before the eyes of those in the coliseum. Oh, and in case anyone misses the point, Mandrake spits, "They are gladiators! They are warriors!" To rise to the proper level of surrealism of this dog-eat-dog world, Stone employs typically weird and wonderful style: densely packed visuals, psychedelic editing and a soundtrack of 82 cuts ranging from Mussorgsky & Ravel to Fatboy Slim. Stone isn't interested in merely bashing modern football: Any Given Sunday looks at the best and worst of the sport. Matters lean toward the worst, with so many sad souls in a spiritually bankrupt environment that seems hermetically sealed off from the real world (both the divorced D'Amato and Pagniacci's widowed mother—played by Ann-Margret—are raging alcoholics). Assistant coach Montezuma Monroe (former Cleveland Brown Jim Brown) is about ready to pack it in and "coach high school. Get back to the basics. Kids don't know nothing--they just want to play. Like you said, Tony: it's pure." In the end, for all the pity and fear, there is grace in purity: teamwork and the love of the game. Any Given Sunday looks terrific in its Blu-ray debut: a serious boost in detail from its DVD counterpart, good black level and accurate color; the authoring passes the tests of the often swift action and kinetic editing scheme. Dolby TrueHD 5.1 and Dolby Digital 5.1 audio options impress all around with immersive effects, full-bodied music and clear dialogue. Hands down, this is the home video presentation to beat for this film. All of the bonus features from the Special Edition DVD reappear here. First, we get a crucial commentary by director and co-writer Oliver Stone. Stone has delivered some of the most interesting commentary tracks around; his soft-spoken lecture style won't please everyone, but many film buffs will happily hang on every word. The commentary by Jamie Foxx is less essential, though a welcome addtion; unfortunately (and surprisingly), Foxx leaves some dead air between his upbeat observations. HBO First Look special "Full Contact: The Making of Any Given Sunday" (27:07, SD) is a cut above the usual promotional hooey, no doubt due to a focus on Stone the auteur-general-coach. There's plenty of behind-the-scenes footage, and interviewees include Stone, Foxx, Jim Brown, Cameron Diaz, James Woods, Dennis Quaid, John C. McGinley, LL Cool J, Jamie Williams, football coordinator Allen Graf, Bob St. Clair, Bill Bellamy, producer Clayton Townsend, assistant football coordinator Marc Ellis, Andrew Bryniarski, Derrick Lassic, and Lawrence Taylor. 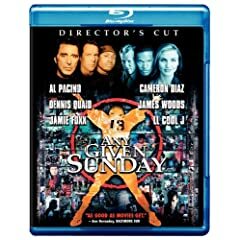 A treasure trove of bonus footage includes Jamie Foxx Audition Tape and Screen Tests (6:40 with Play All" option, SD), fourteen "Deleted/Extended Scenes" (32:39 with "Play All" option, SD) that come with optional commentary by Stone, the fascinating Pacino-filled "Any Given Gag Reel" (4:11, SD), "Football Outtakes Montage" (8:28, SD) and "Miscellaneous Landscapes and Outtakes Montage" (3:26, SD). The disc includes a Music-Only Track, available either in a "Play All" option or by accessing each individual cut from the menu. You get as much of the song as is heard in the film, but not always entirely isolated from sound effects. With Instant Replay, one can "revisit the film's hard-hitting football plays," again in a "Play All" option or by accessing each individual cut from the menu. But wait, there's more: a Poster Gallery, a Stills Gallery, three Music Videos (8:50 with "Play All" option, SD): LL Cool J's "Shut 'Em Down" and Jamie Foxx's "My Name is Willie" and "Any Given Sunday," and the "Theatrical Trailer" (2:26, SD). Lastly but not leastly for those who want to view the movie on the move, a second disc offers a Digital Copy. All site content © 2000-2019 Peter Canavese. Page generated at 04/18/2019 07:09:20AM.